Upon Dr. Daniel Lathrop’s death in 1782, he left an endowment of 500 pounds for a free school to remain open eleven months of the year. The school opened in 1787 and the first teacher was Ebenezer Punderson. The teacher who taught the longest was William Baldwin who was “an excellent instructor…but a rigid disciplinarian.” The schoolhouse remained open for fifty years and in 1843, the Lathrop donation expired. 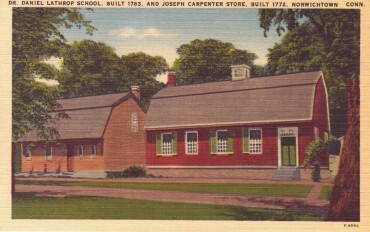 After 1843, the building was used for many purposes such as a summer art studio for NFA Art School Teachers and a meeting place for the NFA fraternity “The Ram Club.” This building is in the Colonial/Georgian style. Today, it is the Norwich Heritage and Regional Visitors’ Center and is open seasonally. The first Jail stood on the southeast corner of the Green. In 1759, a new jail was constructed in back of the Lathrop Schoolhouse, but burned down in 1786. A new building was constructed, and then relocated across the Green. In 1833 a new jail was built at the Landing and the old jail burnt down. In 1775, Dr. Benjamin Church, Surgeon General of the Continental Army, was briefly jailed in Norwich for giving secrets to British General Gage. Seth Miner and Darius Peck were prison keepers.